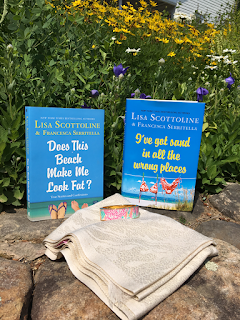 One upcoming book release that I'm very excited about is I'VE GOT SAND IN ALL THE WRONG PLACES by Lisa Scottoline and Francesca Serritella. I've read this mother/daughter duo's essays in the past, and I have found them to be both hilarious and insightful... and sometimes even touching. It's hard to believe that this is the seventh (yes, seventh!) book that they written together, but it's no wonder they keep writing these essays when they have had so much commercial success and have brought joy to so many readers. 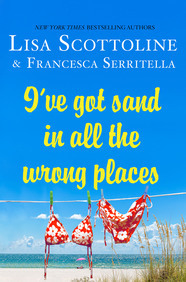 I will be receiving I'VE GOT SAND IN ALL THE WRONG PLACES shortly and can't wait to share my thoughts with you. In the meantime, I have some terrific news. There is a ten winner giveaway going on until July 12th for signed copies of I'VE GOT SAND IN ALL THE WRONG PLACES and DOES THIS BEACH MAKE ME LOOK FAT? as well as a Lily Pulitzer bracelet and wrap. Of course, I would love to win signed copies of the books, but how adorable is that bracelet? You can enter this great giveaway below or access it directly here. Good luck! I love their essays! What a great giveaway!